April 30, 2018 – West Des Moines, IA – Don’t wait to make your restaurant reservations. Mother’s Day surpasses even Valentine’s Day as the most popular holiday on which to dine out according to research from the Iowa Restaurant Association. In fact, nearly half of moms would pick a favorite restaurant as the place to celebrate Mother’s Day. Not sure what to include with that card? “There’s really no need to worry about how to celebrate the moms in your life,” said Jessica Dunker, Iowa Restaurant Association president and CEO. “Moms love restaurants. Not only do restaurants provide a much-deserved reprieve from cooking at home, they also provide a celebratory atmosphere.” Restaurant gift cards and certificates are also a top gift pick for moms, with one in five saying this is their preferred gift. Dunker noted that it is important to get on top of making Mother’s Day restaurant reservations. “It’s not too soon to make reservations regardless of the meal you’re planning to celebrate,” said Dunker. Fifty-five percent of Mother’s Day diners will go out to a restaurant for dinner, 34 percent lunch, 30 percent brunch, and 12 percent for breakfast. In addition, one in five Mother’s Day diners (23 percent) will go out for more than one meal that day. Atmosphere is also an important factor because children are a major part of the mix when dining out on Mother’s Day. Two-thirds of those dining out on Mother’s Days this year will have children under the age of 18 in their party. Looking for a new restaurant to try this Mother’s Day? Dunker encourages people to check out Dine Iowa, a free statewide restaurant directory. Available online as well as a free smart phone app and on Facebook, Dine Iowa allows consumers to check out menus and hours, as well as run unique searches on everything from Gluten Free offerings to patio seating. It is available at www.dineiowa.org. The Iowa Restaurant Association is an advocacy organization supporting Iowa’s hospitality industry with educational and promotional programs across the state. www.restaurantiowa.com. Thursday, April 5, 2018 – Des Moines, IA – Congratulations to Jessica Dunker, President & CEO of the Iowa Restaurant Association, who has been named the 2018 Inspiring Women of Iowa Courage Award Recipient by the Girls Scouts of Greater Iowa. Dunker was nominated by an anonymous source for the Courage Award which is given to a woman who has shown strength in the face of fear, pain, or grief and persevered. Dunker accepted the award at a luncheon held at the Des Moines Marriott on Wednesday, April 4. West Des Moines – February 12, 2018 – Today the Iowa Restaurant Association announced that in 2017 more than 6,000 foodservice professionals earned their food safety management certification. The Association also reported that more than 17,000 have received the credential in the past three years. The credential is earned by taking a class and passing a national exam on topics ranging from contamination prevention, appropriate hold and cook times and temperatures, and sanitation imperatives. To receive the credential, foodservice professionals take ServSafe™ – a one-day, nationally developed class based on the current food code and best practices. Training classes are offered in English and Spanish at the Iowa Restaurant Association office and across the state via Iowa State University Extension and Outreach. Classes are $150 and can be found online at www.restaurantiowa.com. West Des Moines – February 5, 2018 – More than seventy million Americans will celebrate Valentine’s Day at a restaurant this year according to the National Restaurant Association. Many restaurants plan to offer special promotions, entertainment, flowers and other romantic items, making a night at a favorite or new restaurant a perfect gesture for the one you love. Those with busy schedules who choose to celebrate their love on a night other than February 14th are in luck. Nearly one-third of consumers prefer to receive a restaurant gift card from a significant other over chocolate, flowers and even jewelry this holiday. Think ahead and give the gift of a great dining. 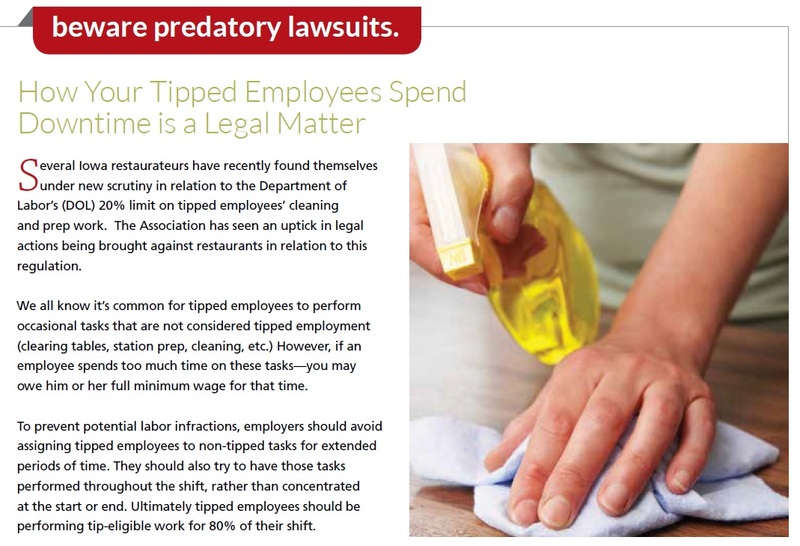 Under Iowa’s current antiquated system, only hospitality operators are required to insure themselves against the behavior of others. This mandated insurance is often cost-prohibitive, providing little coverage to the business or assistance to innocent victims. Des Moines – January 22, 2018 – The Iowa Restaurant Association is asking state lawmakers to pass insurance reform that would make it possible for restaurant and tavern operators to secure better policies to help compensate innocent victims if an intoxicated person causes harm and the restaurant or bar is held partially responsible. Called “DRAM” insurance, in Iowa this coverage requirement is unique to those who “sell and serve” alcohol such as restaurants and bars. There is no similar requirement for those who “sell” unopened alcohol such as box stores, pharmacies, grocery, and convenience stores. According to Dunker, Iowa ranks 46th in the nation in “insurability” for DRAM. “That’s a pretty unattractive marketplace,” says Dunker. She points to the rankings from ISO, an organization that provides actuarial and other information about property/casualty insurance risk. This data is used by insurance carriers to select markets and set rates. The Association hopes their proposed changes will bring Iowa’s DRAM insurance grade in line with surrounding states. “Nearly anything would be better than what we have today,” said Dunker. The Iowa Restaurant Association will be meeting with legislators this week to discuss their proposed changes. A copy of their proposed bill can be found here. Technology may be an increasingly important tool for getting guests to walk through the doors of a restaurant, but consumers still prefer the “human touch” once they arrive. Des Moines – January 15, 2018 – Research from the National Restaurant Association reveals that having the ability to view an online menu before choosing a restaurant was the difference maker for 60% of patrons looking for restaurants. Millennials were even higher with 74% citing access to an online menu as the primary factor when opting for one restaurant over another, and 68% of Gen Xers and 50% of baby boomers saying the same. Additionally, the ability to read online reviews is important to all ages with nearly six in 10 adults saying this was a key decision maker when picking a restaurant. However, once that decision is made, most patrons prefer to interact with people. Nearly half of consumers surveyed said technology can complicate restaurant visits and ordering. In fact, 74% said the inability to ask questions can detract from their restaurant visit or ordering experience. Results cited from the National Restaurant Association’s Technology Consumer Survey. Des Moines – January 8, 2018 – Iowa restaurants are well positioned to be on the cutting edge of 2018’s top culinary concept according to the Iowa Restaurant Association. A recent survey of top chefs found that 74% consider “hyper-local” restaurant concepts – including those with onsite beer brewing, house-made items and even restaurant gardens – to be the top culinary concept trend for 2018. The National Restaurant Association surveyed 700 American Culinary Federation members in October – November 2017, asking them to rate 161 items as a “hot trend,” “yesterday’s news,” or “perennial favorite” on menus in 2018.